Local history buffs and visitors to the Wood River Valley will be able to view the area’s lineage in a whole new light come July 10. The Ketchum Ski and Heritage Museum is reopening after a five-month renovation next week with a new exhibit entitled “Railroad Ties: Tracking the History of Sun Valley,” featuring interactive exhibits and an illustrated story timeline of the economic and social development of the region. The Community Library Association took over control of the museum from the Ketchum/Sun Valley Historical Society, and with the new ownership comes the information-rich resources of the library’s Regional History Department. Executive Director Cynthia Dillon said the collaboration between the museum’s physical artifacts and the library’s historical records and photos make for a natural “marriage” of the two collections. Dillon, a historical archaeologist, said the library has more than 127,000 items in collections. Dillon said the library preserved the Ski Hall of Fame section, moving it to a separate building. Director Taylor Pasley said they’ve also included a timeline about ski technology development in the valley. Pasley worked at the museum while it was under the Historical Society’s jurisdiction and transitioned over to the library ownership when it took control in February. He’s putting the final touches on the exhibit for next week’s opening. The panels in the main building tell the story of the Wood River Valley starting with Native American history through early gold prospectors, the mining and sheep industries and the expansion of the railroad. The timeline ends with the train track construction in Sun Valley and the growth of Sun Valley Resort. “Along the way, we try to give as much interesting information about the valley and its different industries,” Pasley said. 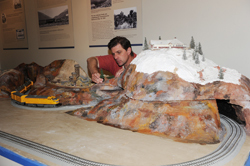 Pasley is in the process of finishing a topographical diorama of the Union Pacific railroad winding through Ketchum and Sun Valley. It’ll be one of several interactive components to the exhibit, along with an archaeology box for kids and a historical photo kiosk. Most of the funding for the museum has been privately donated, Pasley said. Their artifacts are mostly local donations, with a few on loan from the Idaho State Historical Society. Starting Thursday, July 10, the museum will be open Tuesdays through Saturdays from 10 a.m. to 6 p.m. The cost of entry is $5 for adults and $2.50 for students and seniors over 65 years old. Children under 5 get in free. The museum also offers annual memberships.